From our centre just a short trip from Birtley, Tyne and Wear, the Vitaphysical team offers massage and osteopathy treatments to cure your body’s aches and pains. Whether you’re looking for relief from pain or need to introduce more relaxation into your life, our friendly musculoskeletal practitioners can help. The Vitaphysical centre was opened in 2007 by osteopath, Jason, and massage therapist, Bronyia, in those days it was known as Sunderland Back Pain Centre. Following successful feedback from patients and expansion of the treatment team, the centre’s name changed to reflect the more inclusive nature of care offered. A back pain centre is still held at Vitaphysical alongside sessions for frozen shoulder and neck pain but a host of other conditions are now catered for, a list of which can be viewed on our what we treat page. Qualified professionals carry out all treatments; Osteopath Jason works alongside massage therapists Bronyia, Emma and Kirsty to administer treatment for everyday conditions such as headaches and posture problems. We offer a comprehensive range of massage therapies including full body massage, deep tissue massage, relaxation and Thai massage. Our sports therapy builds core strength and can be used to aid pre and post event training. We also work with mums to be to provide relief from pregnancy pain through pregnancy massage. 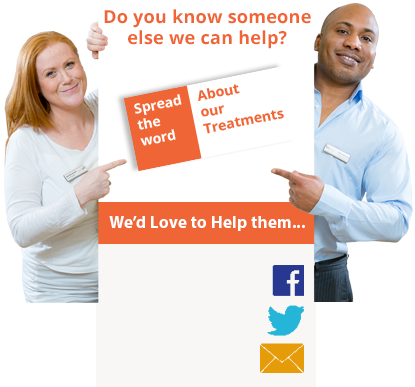 To find out what course of treatment is best suited to your needs, please call for a free telephone consultation. One of our team will be happy to discuss your individual requirements with you and will be able to guide you through what you can expect from your first visit. They will also discuss the discounts available for you to download on site, which are redeemable against your treatment. Of course, it’s not always possible to know when pain will strike and for this reason we also offer a number of emergency appointments, which can usually be arranged for the same day or within 24 hours of your call. Many of our patients choose treatment with us following courses of physiotherapy or visits to private chiropractors that have had limited success and we’re very proud of our success rates. You can read a number of our patient success stories here on the Vitaphysical website. To book an appointment with us you can use our easy online booking system or contact us via email info@vitaphysical.co.uk or by telephone on 0191 565 8886. You’ll find our clinic on John Street Sunderland, just 20 minutes drive along the A1231. We are just a short walk away from Sunderland train station. You can view a map on our location page.